At the McDonald Farm, the 42nd and 88th Illinois continue their retreat west. General Beatty rallies the remaining two regiments of his brigade in the woods west of Kelly Field. Bridge’s Battery retires to the hill settled by the Snodgrass family. The left half of Helm’s Brigade, hammered by the compact Union lines, finally retreats. General Helm is mortally wounded attempting to rally and coordinate his men. Colonel Joseph Lewis of the 6th Kentucky, upon hearing of Helm’s wounding, assumes command and retires the right half of the brigade to the east to reunite the two wings. After the Confederates retire, the men of the 1st Battalion, 18th U.S. return to the main line, taking their logs with them. To the south, Polk’s Brigade crests a low ridge and is stopped cold by the Union fire. Wood’s Brigade splits. The three right regiments are halted on the ridge by Union fire. 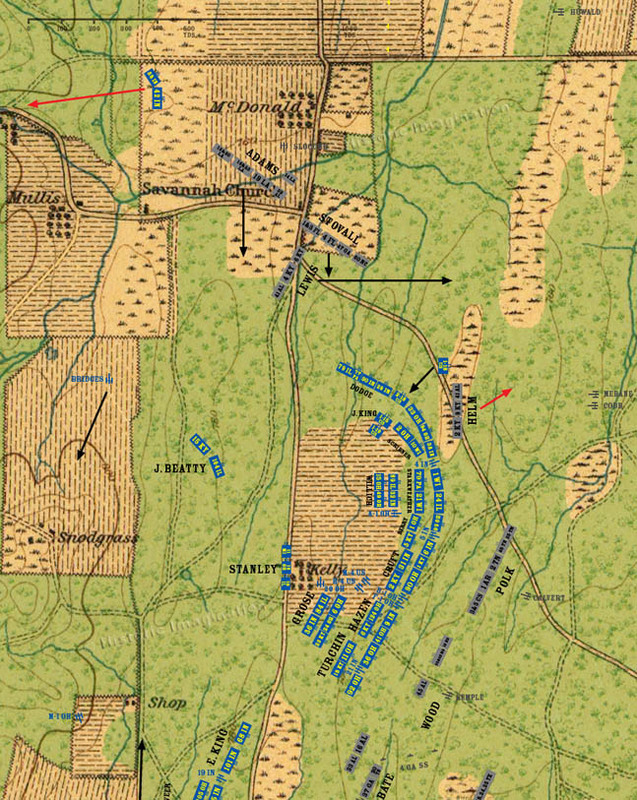 The 16th and 33rd Alabama wander too far to the left and end up in front of Bate’s Brigade of Stewart’s Division, where they halt. Stanley’s Union brigade arrives at the Kelly House.